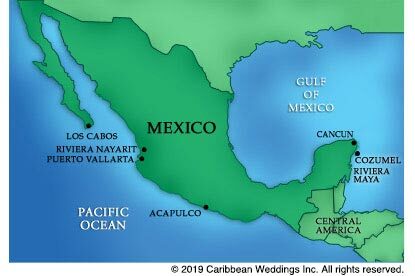 Mexico is located between the Gulf of Mexico on the cast and the Pacific Ocean on the west, and is bordered by the United States on the north and by Guatemala and Belize on the south. 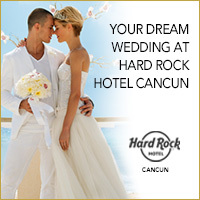 Searching for Mexican wedding venues? Find all the latest information about Mexico below and contact a Caribbean Weddings Specialist today! Northern Mexico is known for its extreme weather conditions and characterized by its deserts, nature reserves and rugged mountain ranges. Central Mexico is the Mexican heartland where you will find plenty of natural surroundings, picturesque towns full of life and color, and beautiful colonial cities, some of which have been declared World Heritage sites. Southern Mexico is lined with the shores of the Gulf of Mexico and the Pacific Ocean where you'll experience an abundance of marshes, mangrove swamps and forests, all of which are ideal for ecotourism outings and exciting outdoor adventures. The Yucatan Peninsula is the gateway to the Mayan world. You can enjoy the white-sand beach resorts and the blue waters of the Caribbean Sea, where you can scuba dive along the world’s second largest coral reef. You can also swim in fresh water pools in submerged caverns, known as cenotes. The Pacific Coast features cities and towns with rich cultural and culinary traditions, as well as some of the best beaches for water sports like surfing and fishing. The Baja California Peninsula is a territory that has been inhabited from time immemorial. You can play golf on world-class courses, discover the underwater treasures of the Sea of Cortez, and witness the amazing migration of the Gray Whale.